Tokyo, November 7, 2017 - NEC Corporation (NEC; TSE: 6701) today announced the development of an Augmented Reality (AR) solution to assist users with the selection of items through the use of smart glasses, a smart watch and new "ARmKeypad" (1) functions. This solution enables users to perform tasks without having to look away from objects, making it ideal for use in manufacturing, logistics and other industries. Currently, NEC is carrying out demonstration tests at a hospital pharmacy (2) and a manufacturing floor, where it has confirmed a reduction in workplace errors and working time thanks to the assistance of the new solution. Visualizes work procedures The solution capitalizes on AR in order to display work procedures on a pair of smart glasses, such as guiding users to the location of objects stored on a shelf. This improves the efficiency of operations and reduces mistakes, even for inexperienced workers and in workplaces where tasks often change. Allows "eyes-free" operation The solution enables input operations to take place through the accelerometer of a smart watch worn by users. 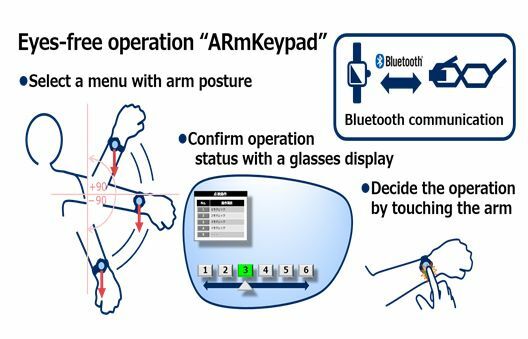 Changes in the incline of a user's arm can be understood in order to select items from a menu screen displayed on a pair of smart glasses. Finger contact with the arm can also be used to make selections. This allows for confirmation and registration to take place without looking away from an object. (1) Demonstration test at a hospital pharmacy NEC is conducting a demonstration test aimed at preventing work errors when selecting drugs in a hospital pharmacy. The system reads barcodes on prescriptions with a camera on the glasses, displays a drug selection list on the glasses, and provides guidance about which drug on which shelf is to be selected. This is done using AR when the operator looks at the medicine cabinet. As a user of the solution picks up a drug, they are able to confirm and register the item by inclining their arm. This has confirmed that selection errors could be reduced to virtually zero. Using conventional methods, approximately five errors are assumed per 300 operations daily (*3). (2) Demonstration test at a manufacturing floor A demonstration test is being conducted at NEC Networks & System Integration Corporation in order to ensure efficient management of equipment. The solution assists in locating equipment from cabinets where it is temporarily stored using an AR guidance display. The demonstration test confirmed that work time could be reduced by 18.2% when compared to conventional methods. *3) The technical verification was carried out in a limited environment, and the number of errors is an estimation based on measured values. Before providing drugs, multiple confirmations are conducted. The number does not represent cases of actual medication errors.